“Will you be dining in?” asked a young man wearing a retro, pointed, diner hat. 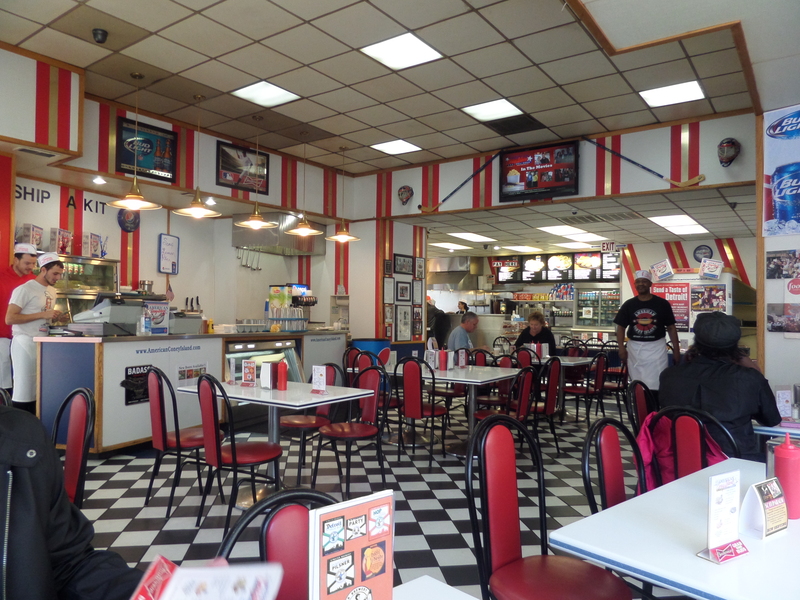 We had arrived at American Coney Island in Detroit—a coney dog mecca for almost a century. Michigan takes their coneys seriously. After all, the sauce-covered hot dog is reputedly a Michigan creation. A devout lover of the Detroit coney (an encased frankfurter covered in chili, yellow mustard, and onions), I couldn’t wait to sample their frankfurter and fries. The dog did not disappoint…nor did the story of the venue’s history. Opened in 1917 by Gust Keros, a Greek immigrant, the restaurant has been family-owned since its beginning. Introducing himself as “Dan, Dan, the Hot Dog Man,” Dan Keros came over to our table and delighted me with tales of the restaurant, his family, and downtown Detroit. His story of his family’s hard work and hope was a familiar one to me. A tale of interdependence and individualism that embodies Detroit. Many immigrants came to the area during the early 1900s to earn money that would eventually bring the rest of their families over to the States. In 1916 when Ford Motor starting offering an unprecedented $5 a day for unskilled labor, workers teemed to the area by the thousands. Laborers created an ethnic melting pot and formed the backbone of this working-class town. Leaving American Coney Island, I was ready to roam around and explore the downtown area’s treasures. We walked a block over to Campus Martius, a park where the city’s point of origin is marked by a medallion in the walkway. The park boasts an ice-skating rink in the winter, a café, and the Soldiers’ and Sailors’ Monument (capping the monument is the fierce-looking Michigania, a heroic woman brandishing her sword and shield). I traversed down Griswold Street toward an Art Deco skyscraper—the Guardian Building (1929). Pewabic Pottery maven, Mary Chase Perry Stratton, worked closely with the architect, Wirt Rowland, to design the elaborate interior. The multi-colored tiles, along with various types of marble and stone create a breath-taking lobby. The grand metal archway with a Tiffany clock creates an impressive entry to the main hall where a five-story mural by Ezra Winter depicts Native American themes and the heritage of the city. Venture down Griswold and cross over to the corner of Jefferson and Woodward to see two iconic Detroit monuments—The Spirit of Detroit (1958), a Marshall Fredericks bronze, and the Monument to Joe Louis (1986), a fist sculpted by Robert Graham representing the power of the famed boxer, as well as his efforts to fight segregation. Crossing the multiple lanes of Jefferson Avenue, I was drawn to the water where escaped slaves had looked across the Detroit River towards Canada…and freedom. 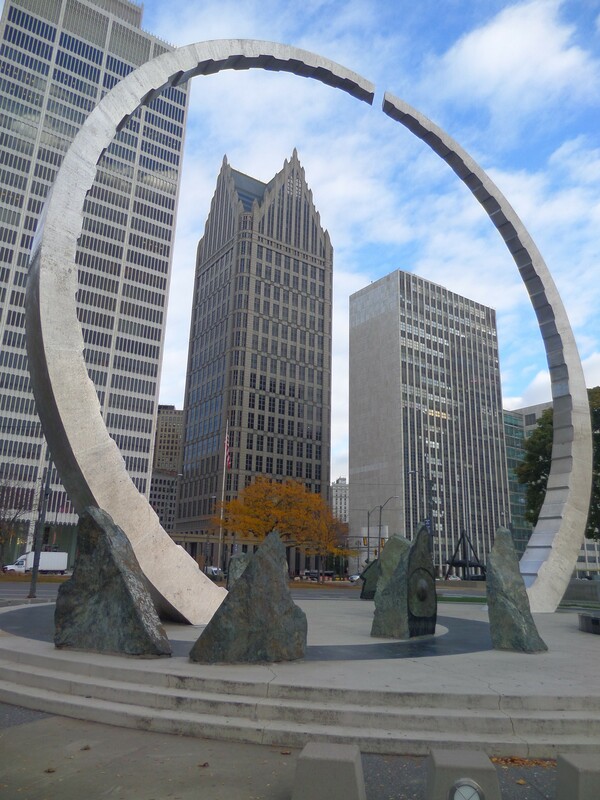 Located in Hart Plaza, the Gateway to Freedom monument depicts passage through the Underground Railroad and stands as a testament to Detroit’s heritage. The statue, emphasizing the artistic expression of the city, also underscores why people migrated to Detroit—hope for a better future. Mariners Church (1849), a block away, was a stop on the Underground Railroad. Detroit pays homage to the workers that fueled production and built this city through the Labor Legacy Landmark. Under two magnificent steel arcs (by David Barr), fourteen Vermont granite boulders (by Sergio de Guisti) depict the sacrifices and achievements of American workers. Inspiring quotes on green stone form the base of the monument. After completing my downtown walking tour, I drove over to the midtown cultural center where I was drawn to a building with a phoenix and a scarab on its exterior. The Scarab Club, I would find out, was started in 1912 as a member-based organization for male artists. A young man at an old desk greeted us as we entered the 1928 building. Since I wasn’t sure if we were supposed to be there, I was a little hesitant, but he took great pride in sharing with us this place where artists have gathered, created, and inspired. Clearly a lover of Detroit’s art history, he showed us an upstairs meeting room where noted artists signed the ceiling’s beams. Downstairs, a gallery allows visitors to view the creations of current Scarab artists—some of whom have studio space on upper-level floors. The nearby Detroit Institute of Arts is a must-see. Its Beaux-Arts façade with a copy of Rodin’s The Thinker out front is a grand frame for the art within. If time permits, cross Woodward Ave. to see the Detroit Public Library with its magnificent reading room and massive murals or hop over to the Detroit Historical Museum for an overview of the city’s past. Detroit’s collection of art is one of the foremost in the States. The Institute’s objects showcase artistic creativity. The human experience from ancient times to the present is highlighted by some of the world’s greatest artists, including: Caravaggio, Van Gogh, Rembrandt, Gentileschi, and Picasso. After roaming by suits of armor and past a 16th century French chapel, I stumbled (literally—there was a bump in the floor) into the Rivera Court where Diego Rivera’s murals, Detroit Industry, loom large. A charming docent with a British accent motioned to the several stories-high paintings on the walls surrounding her. “Any questions about the art?,” she asked. I was thrilled to hear her explanations as we wandered around the room. The DIA has a world-class collection, and the workers are like everyone else we encountered along our trip—accessible, welcoming, and unpretentious. We chose a historic hotel a few miles outside of Detroit in Dearborn. This suburb hosts the renowned Henry Ford Museum and Greenfield Village and provided a slower-paced setting to retire for the night. The elegant Dearborn Inn, sitting on 23 acres of gardens and landscaped grounds, provided the perfect backdrop for our historical trip. Opened in 1931, the hotel has hosted many famous people—Eleanor Roosevelt, Norman Rockwell, and Charles Lindbergh among them. On the grounds sit five historic replica homes that guests can stay in. The hotel proper, where we stayed, boasts two restaurants and lots of amenities. The staff was pleasant and welcoming as they greeted us to the inn. I enjoyed hot apple cider in the inviting and richly-appointed lobby before unpacking in my spacious concierge-level room. Before I had even unpacked, staff brought us a silver bucket filled with ice-cold bottled water and tasty snacks. The nibbles were just the trick to stave off hunger before dinner time. I was craving Italian food so we ventured off to a place called Roman Village. I asked about the restaurant’s history and Rita, the owner, told us a tale about her emigration from Italy and opening the restaurant in the 1960s. Their pasta is freshly made on site, but what really impressed me was the love that I could taste in her recipes. 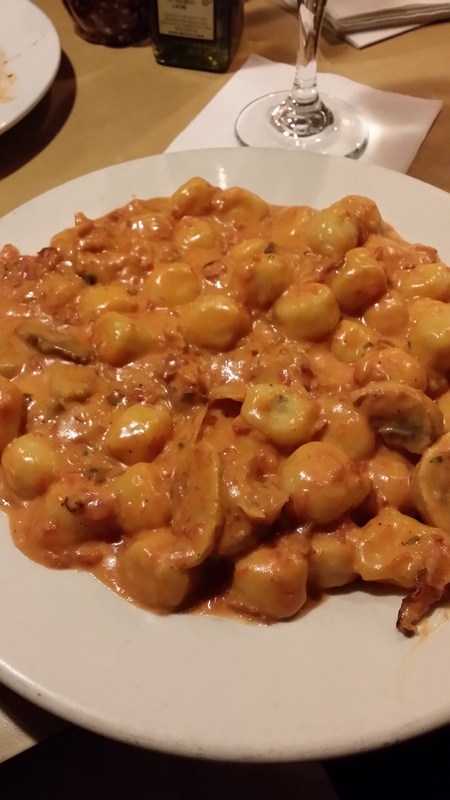 Rita sent over gnocchi with her namesake sauce. The perfect dumplings and creamy tomato sauce made me swoon. But as important as the good food was the fact that Rita made me feel like family. By sharing her food and stories, she created an experience for my husband and I that we are not likely to soon forget. After a long-day of sightseeing, and with full stomachs, we decided to enjoy a drink in the inn’s Ten Eyck Lounge. The interior invited relaxation and the welcoming bartender made the experience all the better. After telling her about our travels for the day, she enthusiastically affirmed our choices and told us more about Detroit’s history. Intense pride in their city’s past seems to be a common denominator among Detroiters. The bartenders, docents, restauranteurs, the people who bring their talents, and the people who tell its tale and keep it thriving are the heart and soul of Detroit. It is they who keep the promise and hope of the city alive. It is their belief in Detroit that makes the city great and a great place to visit. After a good night’s sleep, we decided to head off to the historic public market district of Eastern Market. First opened in 1841 and moved to its present location in 1891, the brick buildings hold a visual (and literal) feast. Musicians played on the periphery of the warehouses where vendors hawked fresh produce, flowers, baked goods, and other tasty delights. After picking up a few goodies, we lined up to wait for Supino’s Pizza to open. The Napolitano-style pie was worth the 20-minute wait. We left to visit the Edsel and Eleanor Ford House on Lake St. Clair (the kind of Michigan lake where one can’t see the shore on the other side). Passing by Heidelberg St., we pulled over to see where a run-down area has been turned into an “Alice in Wonderland” type art project called the Heidelberg Project. A quick stop at the historic Pewabic Pottery shop afforded me the chance to tour this historic artist’s haven and pick up a beautiful dragonfly tile in the Art Nouveau style. As we drove towards the Ford Mansion, I was struck by how art is omnipresent in Detroit—from outdoor installations, graffiti murals, Motown music, and more formal decorative arts, the city takes great pride in its citizen’s talents. 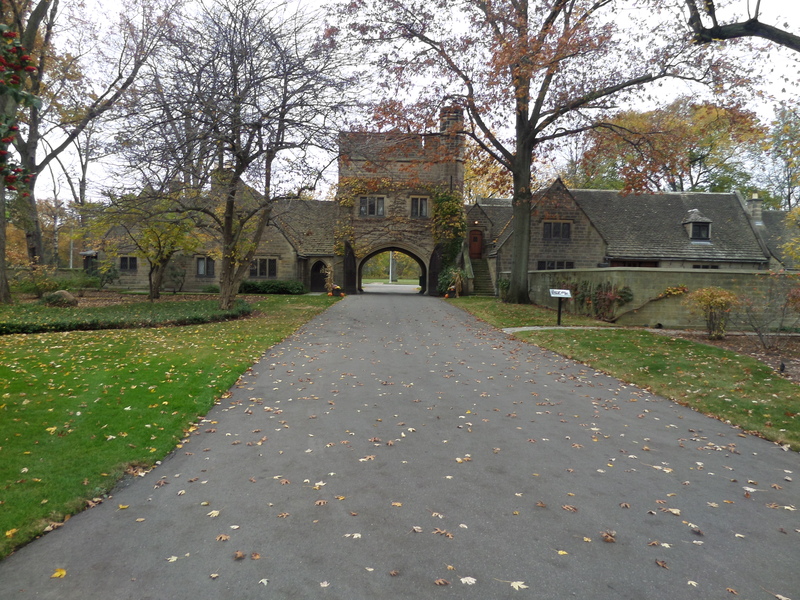 Arriving at the stately Gate Lodge of the estate, one could easily mistake the large sandstone building for the Edsel and Eleanor Ford House. A guard came out of his post and ushered our car through two massive, arched wooden doors. The home looks to be straight out of Cotswolds Village. The house’s architecture and design deserve more space than I can permit in this article, but suffice to say this Albert Kahn home with Jens Jensen grounds and interior work by Walter Teague is a real stunner! Each of the 60 rooms reflects the exquisite taste of Edsel (only son of automobile magnate Henry) and Eleanor Ford. They brought architectural features from great estates of Europe to be worked into the design of their home. Our gracious docent gave us an intimate tour of the home. It was obvious from her demeanor that she had great respect for the Ford family and a reverence for the home and the magnificent objects within. With 2600 year-old Chinese vases, a 16th century English fireplace, a palatial French crystal chandelier, and some of the world’s greatest works of art, each room is comparable to a museum of the highest order. But yet one gets the feeling that the Fords were unassuming. Although heads of state and titans of industry may have been entertained there, there was still a sense of modesty. The Fords had created an elegant and comfortable place to raise their children. It was a home. They surrounded themselves with pieces that they found beautiful …not because they were trying to create an effect. Art was a part of their daily lives and, as great patrons of art, the Fords endowed much of their collection to the Detroit Institute of Arts. Eleanor Ford left a great legacy by endowing the house to the public. In doing so, she left a door open to the past that we can all enter through. No longer known for the automobile production that earned Michigan a spot on the Rust Belt, Detroit has publicly suffered financial woes. But it is very much a thriving cultural center and there are plenty of things to do in Detroit. Once the capital of Michigan and an important early settlement, the city is rich with history. Detroit’s amazing architectural, artistic, and cultural sites celebrate its past and illuminate its future. Some people may write Detroit off as a travel destination—it’s not shiny enough, its buildings are old, some are vacant—but to do so would be a mistake. Detroit is a city with a sense of living history and a place to be now. Throughout the weekend we spent there, we met many people—the vignettes of their lives intertwining and overlapping to create a beautiful tapestry. The Detroit Renaissance of the late 1800s/early 1900s is still ongoing. Artistic expression is found throughout the city from its decorative arts to its music to its culinary creations. The spirit of inclusion that drew people of diverse backgrounds to migrate there is still very much alive. 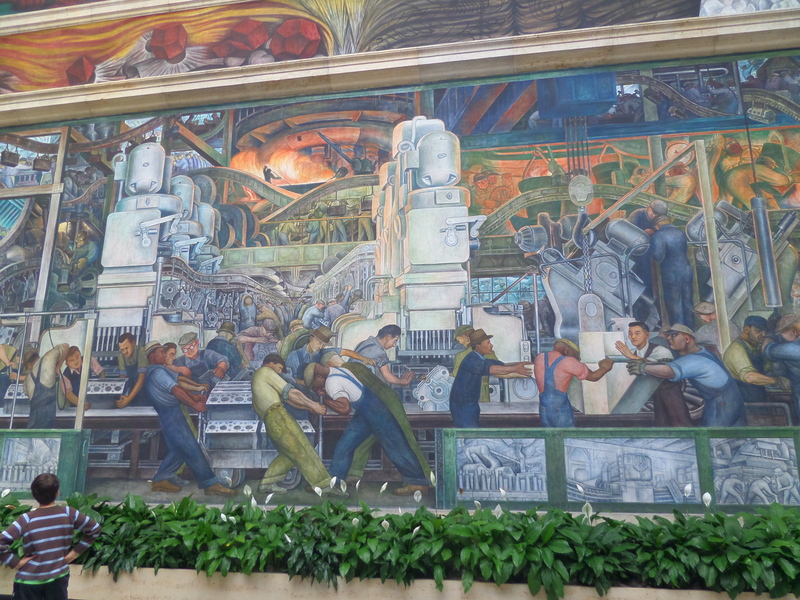 Diego Rivera described it well in his famous murals of Detroit industry where he depicted different races as the essential elements needed to make steel. Detroit is tough. It is gritty, accepting, and diverse. Detroit is a city of people celebrating their rich heritage and endeavoring to rebuild it. It is a phoenix rising. 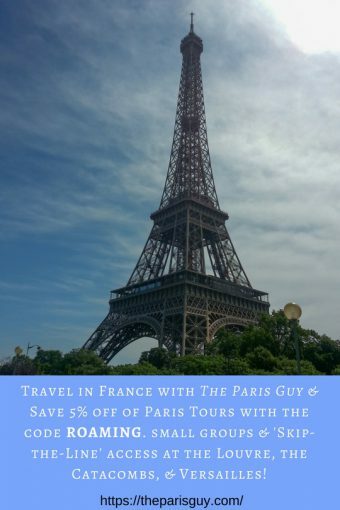 I suggest traveling there while prices are still modest. First Congregational Church and Second Baptist Church—both of these churches, although no longer in their original buildings, were important to the Underground Railroad. A piece of art that all are encouraged to touch. A dragon of glazed tiles from the Ishtar Gate (575 BCE) in Ancient Middle East gallery. Disclosure: I was the guest of the Detroit Institute of Art and the Edsel and Eleanor Ford House, but all opinions and views expressed in this article are my own. Additionally, I chose what places to visit and to highlight in my writing. I love Detroit (it’s my hometown!) 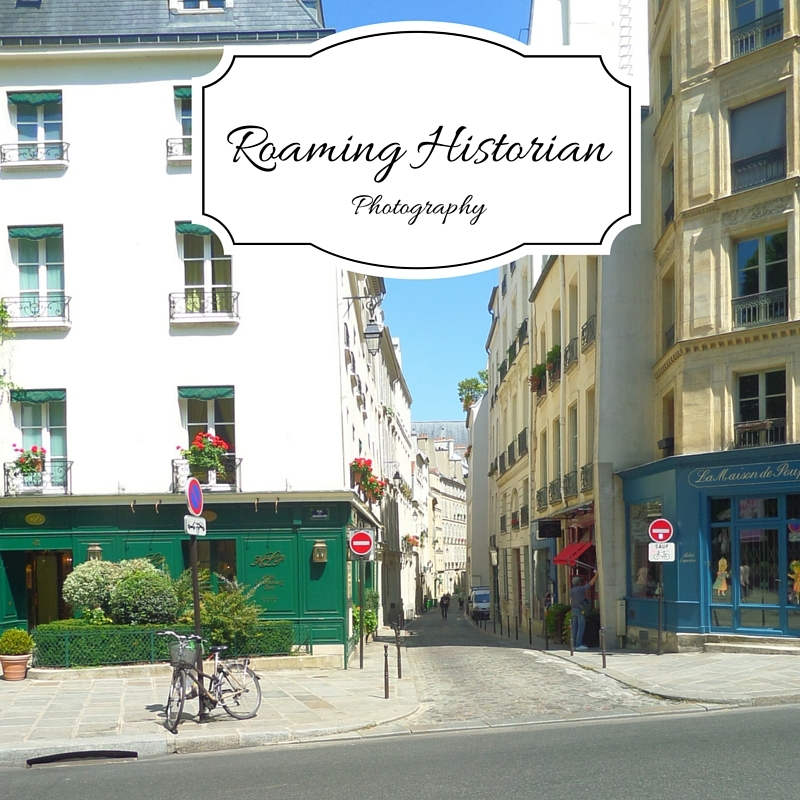 and this is such a great post highlighting some of my fav places. I’ll show your post to my colleagues who think Detroit is a dull and dangerous place. It’s a great city! 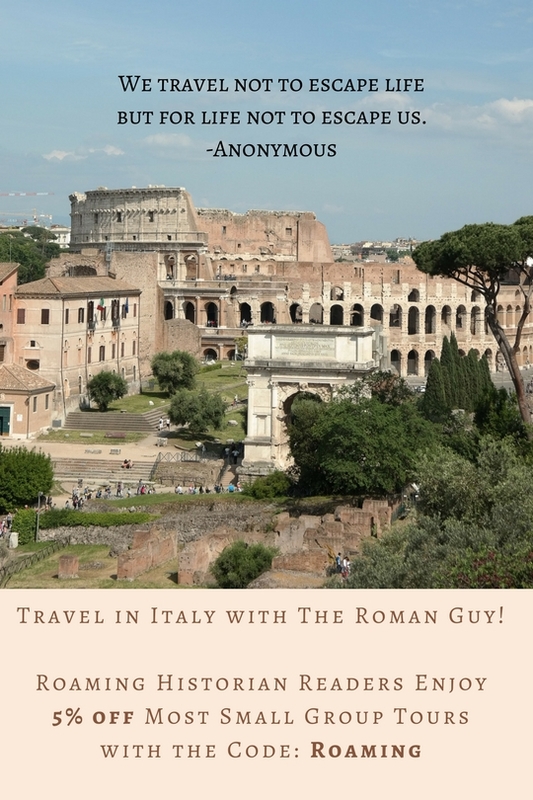 Let me know when you plan a trip and I’ll give you some more ideas.